Dolphin Run is a 2-level home where the great room (living, dining and kitchen) and one bedroom are on the lower level, and the other three bedrooms are on the upper level (accessed by a spiral staircase). 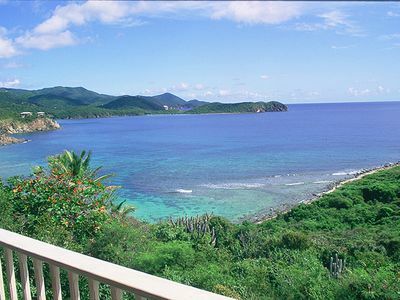 Every room room has a scenic water view and every bedroom has a superb pillow view of the Caribbean Sea. 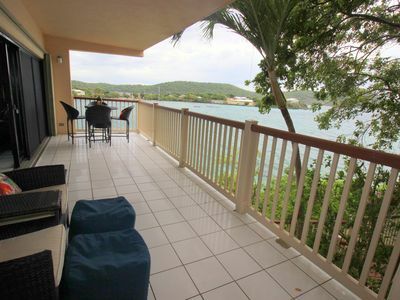 Decks wrap around the house on both levels to insure easy access to the refreshing trade winds and the gorgeous views. The swimming pool and the sun deck are on the west side of the villa in a garden setting that is well protected from the trade winds. The deck also offers discreet clothing optional privacy and all day sun. Down the road from Dolphin Run there is a path that will take you to Hart Bay Beach where there is good snorkeling on a calm day. 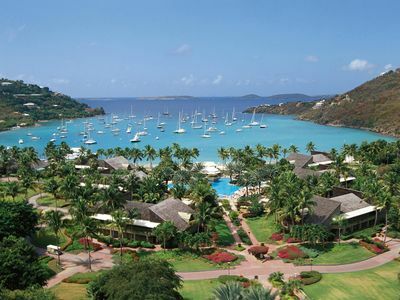 Dolphin Run has a magnificent location on the peninsula that separates Chocolate Hole Harbor from Hart Bay. The house was built on the top the ridgeline that runs down the peninsula, so it has fantastic 260 degree views, that sweep from the mountains in the north to the islands in the southwest. The beautiful views include sunrises and sunsets plus the entire south coast of St John, much of which is unspoiled National Park. The villa is also quite tranquil and semi private, with almost no vehicle traffic or other noise. Mostly the only sound you’ll hear is the music of small waves breaking on Hart Bay Beach below you. This is a villa for sun lovers with sun on your decks from early morning to sunset. It’s about a 2 mile drive into the restaurants, shopping and nightlife in Cruz Bay. There is one bedroom (king/2 twins) with a half bath on the 1st floor, while the three other bedrooms (2 kings, 1 set of twins converts to a king) are on the upper level. The 2 master bedrooms have an attached full tiled bath and the twin guest bedroom has a full bath off the hallway and this is shared with the 1st floor guest bedroom. The upstairs bedrooms are accessed by both interior and exterior stairs and the bathrooms are located between the bedrooms so that none of the bedrooms has a common wall. All the bedrooms have eight foot screened sliding glass doors that open to gorgeous views and to private decks. Three of the bedrooms have an east-southeast view that includes the morning sunrise, and one bedroom has a south-southwest view that captures the colors at sunset. The living and dining rooms are ringed by numerous 8' screened sliding glass doors that create a bright, cheerful interior and provide cooling breezes via the constant trade winds. The living and dining furniture is by Henry Link and is accented with floral upholstered cushions. The living room furnishings include 2 wicker couches and chairs, a matching wicker desk set, terra cotta tiled floors, ceiling fans, recessed ceiling lights and Caribbean artwork. A TV/DVD and a stereo/CD plus wireless internet are provided. There is interior dining for 8 at the glass topped table , plus exterior dining for 6-8 on the tiled patio off the dining room. The kitchen has handcrafted mahogany and cypress cabinetry and an attractive mahogany and tile wet bar separates the kitchen from the dining area. Kitchen appliances include a GE refrigerator/freezer, gas stove and oven, dishwasher, washer/dryer, microwave oven, toaster, blender, coffeemaker and a complete assortment of cookware, server ware, dinnerware and utensils. A telephone, wireless internet, gas BBQ and beach chairs are included. Best Features: On the east side of the villa the trade winds usher in the ocean breezes that cool and refresh you, and if you want a change of environment, the pool and sundeck on the west side of the villa are sheltered from the winds. On the east side you can watch a beautiful sunrise; on the west, watch the sky flame up at sunset. The wraparound decks on both levels allow you access to all the lovely views, plus each bedroom is designed so every bed has a pillow view of the Caribbean. 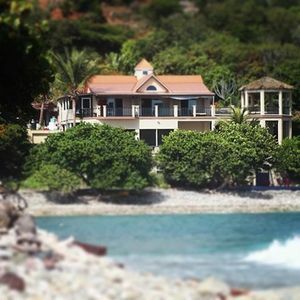 This is a sun lover’s villa, with sun on your decks almost the entire day, while at night the sky is filled with stars and the moonlight shimmers across Rendezvous Bay. Like its neighbor Rara Avis, Dolphin Run is also a home where the sound of small surf breaking on Hart Beach is your constant background music. Dolphin Run’s design is very child friendly and this is an excellent choice for families, while the romantic location is ideal for honeymooners or couples. 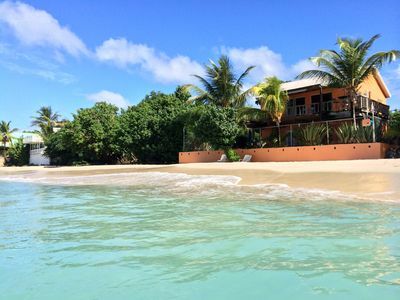 This location is private yet convenient and is an easy 10 minute drive into Cruz Bay. HGTV & People Magazine featured Villa! 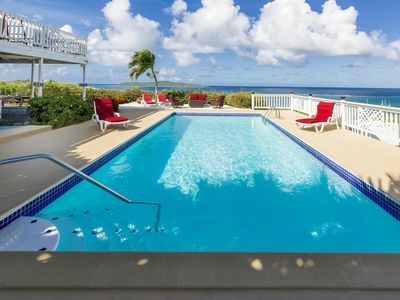 Large Pool & Best Ocean View on Isle! 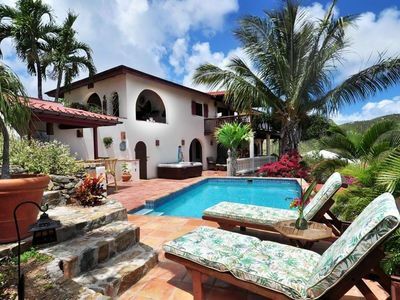 Exclusive Cruz Bay Villa! Amazing water view and sunsets!